Well, ... it looks like I'm at it again! This time, I will be building the TNT because it is just about the same size as my Super Spartan and with a few moderate modifications to my trailer, I can get them both on it at the same time. When I pull the hydro in and trailer it, ... I can pull the TNT off at the same time. In essence, ... I can stay at the lake longer which is always a good thing. Today, ... I stopped on by Glen-L today on my way home from work, ... well about a half hour detour but who's counting, ... and picked up a set of TNT plans, and the fastener set. It's always nice to once again chat with the lovely ladies and to see the very exited and friendly pouch, ... Buckshot. As always, .. any hints, warnings and criticism, ... "GOOD or BAD" are always welcome, ... so please feel free to speak up. Last edited by Bill CNC on Thu Nov 01, 2012 10:08 am, edited 2 times in total. Boy, ... At almost 52 years of age, ... when hearing the words, ... "Congratulations on the birth of your second baby", ... I get the uncontrollable feeling that I should be to going to several banks to empty my accounts, pack my bags and leave rubber on the ground while racing for the Mexican border! Not quite sure about going through that all over again! I'm pretty exited about the build and right now I'm going over the plans and making my list of the goodies to come. One thing I'm not looking forward to is the search for the engine all over again. Here on the southern California coast, you would think outboards were a dime a dozen, hardly the case. Most are salt infested and the ones that aren't, ... the price is through the roof. That's why I ended up getting a Yamato 102 sight unseen from Seattle Washington for my Super Spartan. I got unbelievably lucky on that one. For the other builders of the TNT, .. What steering system did you / are you going use? As far as pictures, ... of course, ... with everything I make, I take bazillions of pictures. Being a prototype builder, I never know if I will be making a second one and the photographic references are a massive time saver. I'm really bad at taking notes mostly because the projects move so fast there is little time to document anything so the camera speaks for my lack of words. One thing that puzzles me is the use of the 1/4" carriage bolts on the top of frame 3 for attaching the Deck Beam to the Side pieces. Why not just use bronze screws or nails? Last edited by Bill CNC on Sat Sep 15, 2012 3:58 pm, edited 1 time in total. Those bolts may be a throwback to the older method of using one gusset between frame members instead of lapping the frames with two gussets. 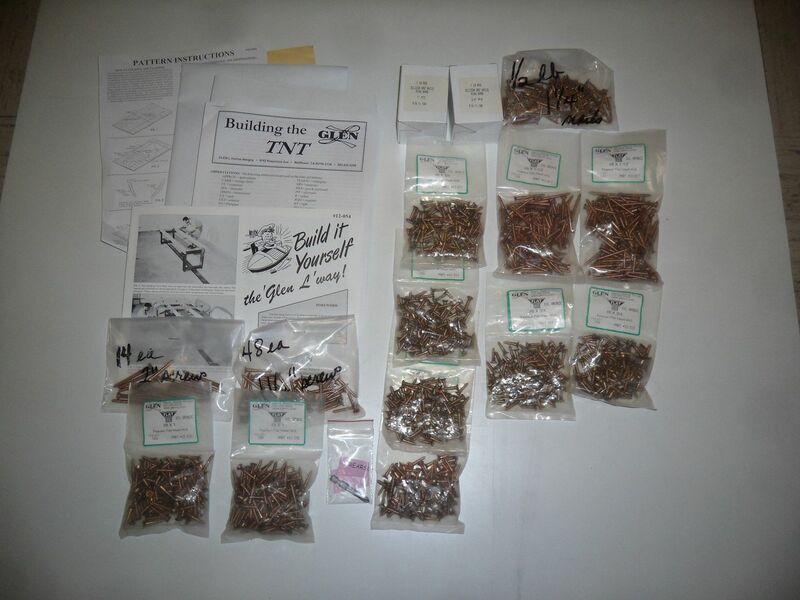 If you use the newer method of assembling the frames, the bolts aren't used. Good luck with the second child and when are you going to dunk the first? Thanks, ... your comment has me looking at the plan more closely than my initial glance and your correct, ... there are "NO" gussets on that joint on frame #3. Maybe I'll add some, or just build it as called. No doubt I will probably put this boat through more than it's been designed for, so I'm currently looking at beefing it up in a few areas. As far as dunking the Spartan, ... Soon, ... I'm repairing my truck at the moment, ... Fuel injection issues. Now it's a real problem, ... at the moment, ... getting my wood for the TNT appears to be on hold for a week. If I took it to the dump, I would have been required to cut it into minimum 4 pieces and have to pay on top of that. Instead, I cut it up into about 20 pieces and got it to all fit into the dumpster at work for, .. FREE! Well, I'm still dealing with a truck that's not happy and keeping me from getting the majority of my wood and taking the Spartan on her maiden voyage. It hasn't stopped me completely though, as I still had some Mahogany left over from the Spartan build, almost enough for all the frame work. I had some .750" plywood from another project, so I made the stem and transom with it. 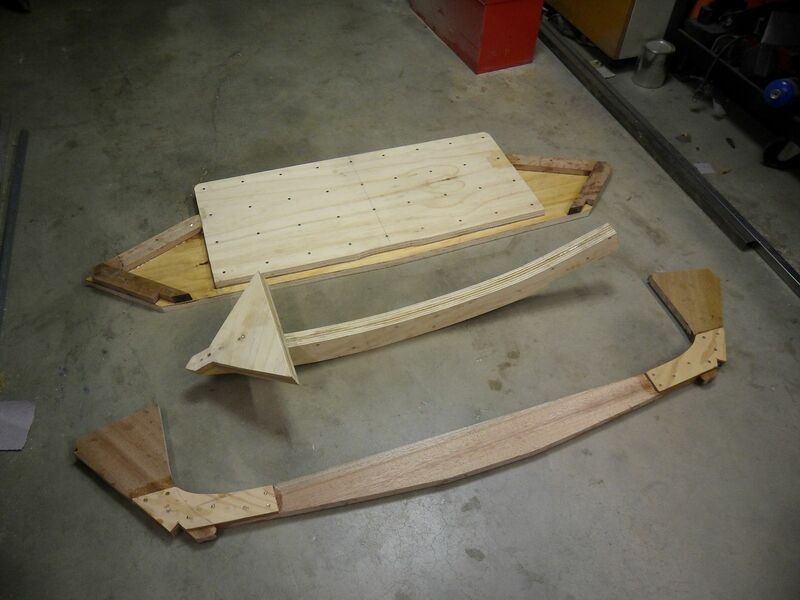 Nothing is glued together yet, but I'll glue up the transom and stem pieces this weekend. 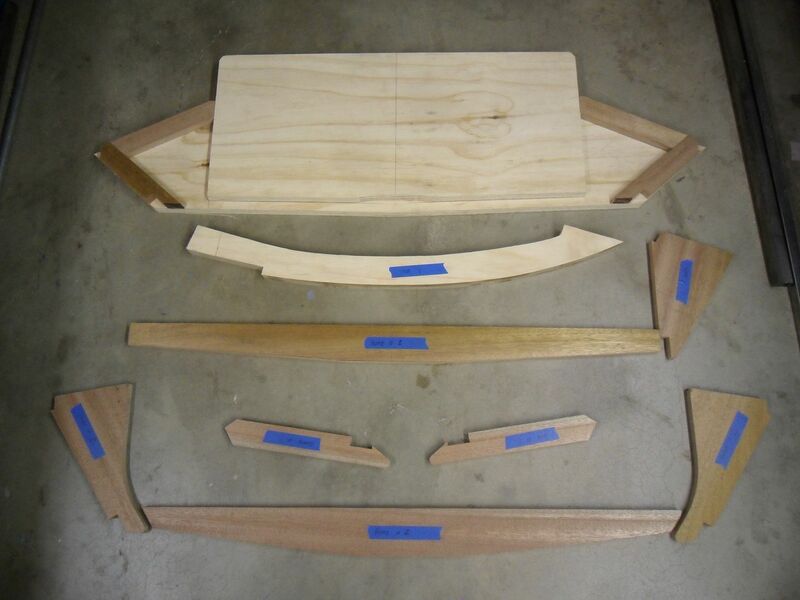 I also have lot's of spare .125" Okume plywood that I'm thinking of doubling, or tripling up to get my gussets. I would vacuum bag them to make sure they were glued real well so it would be comparable to .250" marine plywood in strength. If I just double it, I will laminate a layer of glass between the pieces, if I triple it, I will just leave it all wood. In any case, ... it's going to smell like epoxy around here this weekend. Also, today, We had the Endeavor shuttle fly right over my work today at around 1500 ft. AWESOME to say the least! I lucked out, under all my scrap wood, I found a piece of .250" marine plywood that was just enough for all the gussets. Your moving along now, keep up the good work. Just got off the phone with my wood place and got some great news! Since you cant bring the mountain to Mohammad, ... I'm bringing Mohammad to the mountain. For an extra $25.00, ... They are going to deliver the wood 77 miles tomorrow in the AM!